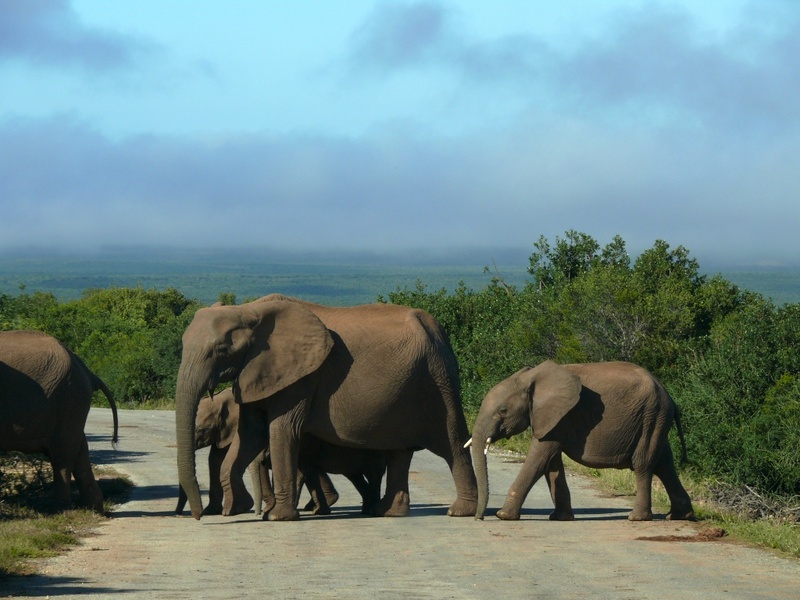 “Addo Elephant National Park is set deep within the dense valley bushveld of the Sundays River region of the Eastern Cape. 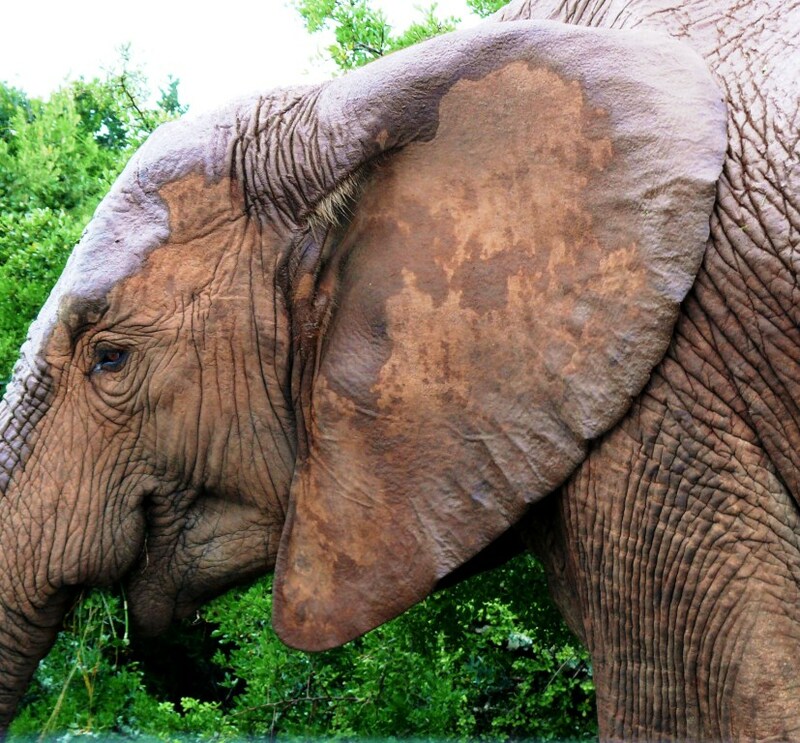 The original Elephant section of the Park was proclaimed in 1931, a time when just eleven Elephant roamed the area. 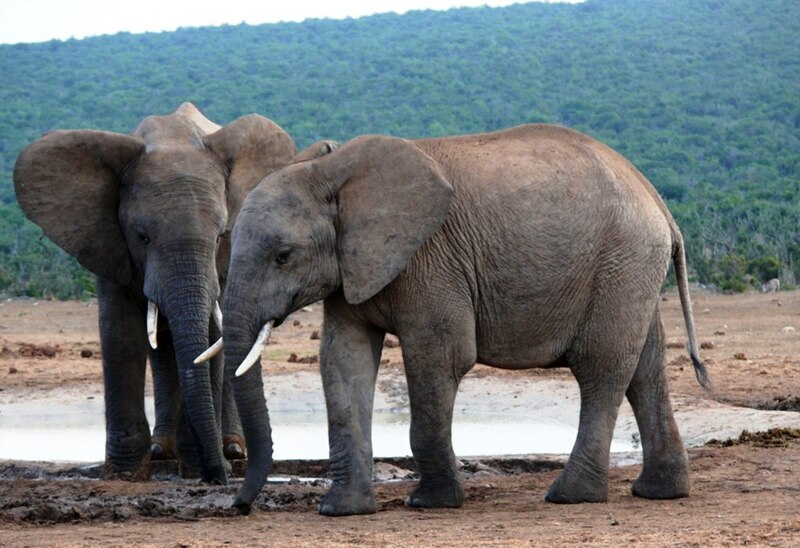 Today, however, over 450 Elephant makes the Park its home, as well as Cape Buffalo, Black Rhino, a variety of antelope species and the unique flightless dung beetle, found almost exclusively in Addo. We left Knysna at around 10 am after another delicious breakfast and set off on the N2 towards Port Elizabeth. An uneventful journey apart from a heavy rainstorm near Jeffrey’s Bay and a 20 minute wait at road works. 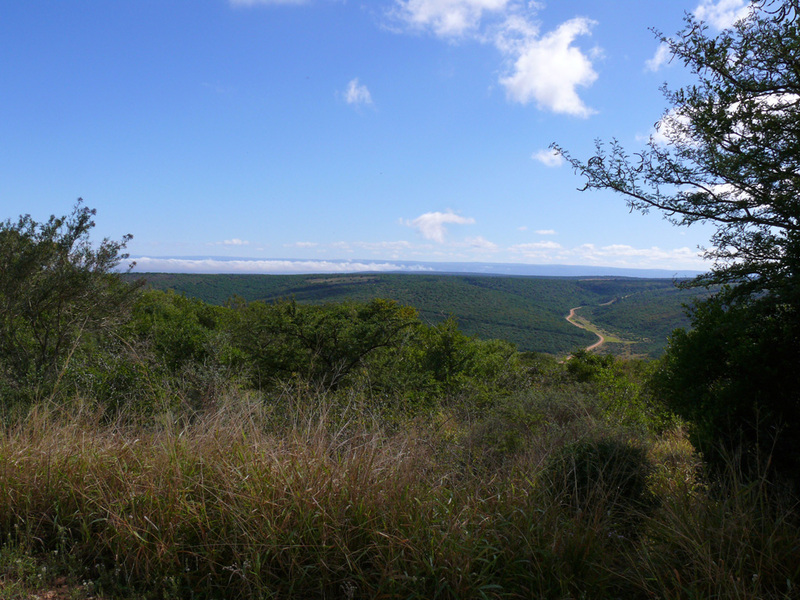 We followed the brown sign route to Addo Elephant National Park which was a bit of a strange route leading to the R335 as it took us through a township on the outskirts of PE and not a route I would have chosen myself. The sky was still heavy and we saw some dramatic lightning on the horizon, but it stayed fine. We reached the park at 2.30 pm and drove to our pre-booked little rondavel overlooking the main entrance Nyati water hole which is floodlit at night. The rondavel was quite sweet – a queen sized bed, some drawers, a separate toilet and shower complete with flatty (a very large spider who eats mozzies so we left him alone) and a wash basin. There was a fridge on the stoep and a table and chairs and braai facilities nearby plus a communal kitchen. The view was idyllic – from the stoep we had a feast of kudu, warthog families, ostriches and Egyptian geese around the waterhole; there was lots of evidence that elephant went there, but sadly we never saw any visiting. That’s not to say we didn’t see any ellies though. Far from it. 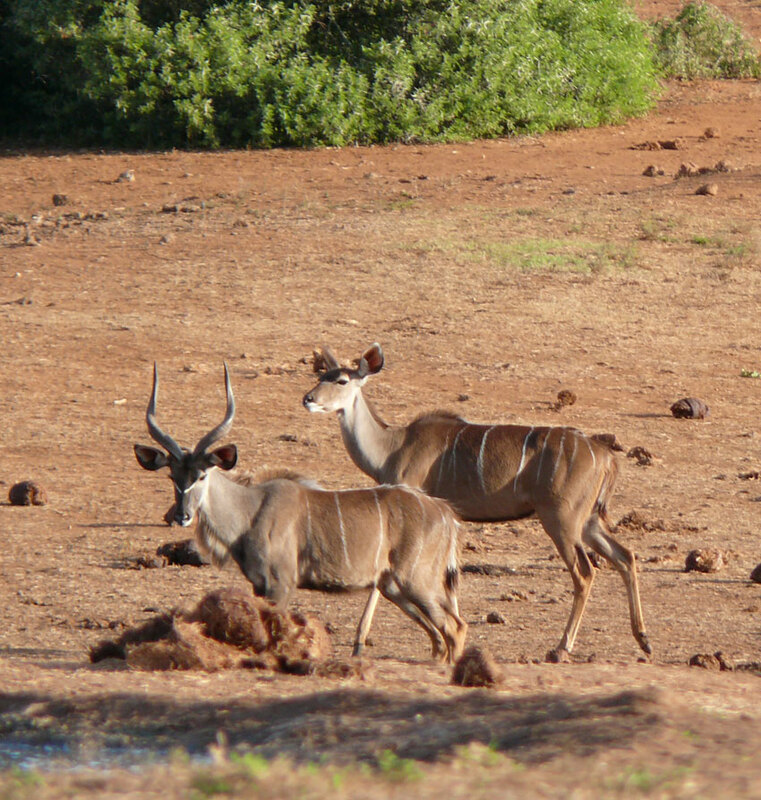 We took a short drive around the park before dark and saw warthogs, kudu and elephants. Sitting only feet away from two large, though young, elephants and watching them drink from the waterhole and greet each other by linking trunks was amazing – I have been fortunate to see elephants close up before, but this was a first for my husband and he was entirely mesmerised by the experience. There were times to come, when that experience was a little too close for comfort. After all these are wild animals, and more than capable of overturning a car. It was 5.30 am. It was dark, it was cold, it was cloudy and it was raining. We were up because we had booked to go on an early morning game drive. 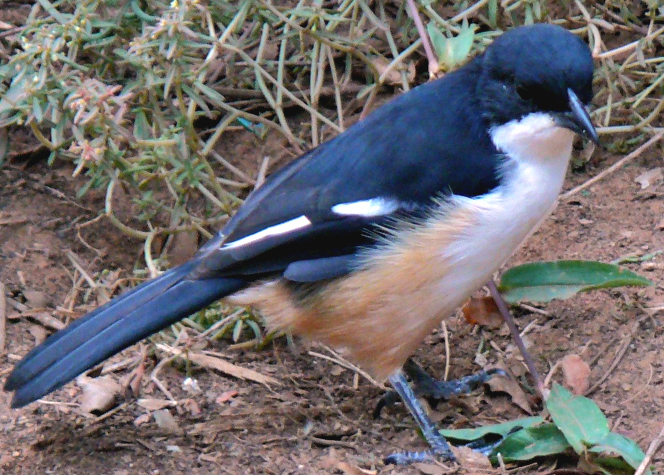 The best time of day to see all sorts of wild animals, or so we have been told. At that moment all I wanted to do was turn over, pull the duvet over my head and go back to sleep! At 6.15 am we were off on a two-hour drive. We didn’t see very much to begin with – it was wet and cold and if I was an animal I’d still be hiding in my den or burrow or wherever it is they spend the night. My hands were becoming numb – at this rate even if we spotted anything I’d never be able to work the camera. Suddenly we stopped. Everyone held their breath and looked around. The guide pointed to a shape in the distance – we looked, we wondered, and then we saw a caracal come into sight, the small cat slowly strolling towards us, its characteristic dark tufts on the large pointed ears and the long tail swinging behind it. Suddenly it stopped and stared right at us, then turned around and walked away, the flash of its white undersides contrasting with the black backs of its very prominent ears. Satisfied now that the pain of getting up so early was worth it, we forgot about the cold and eagerly awaited the next “spotting”. It was a black backed jackal trotting away into the bush. It too stopped and looked around towards the noise of the vehicle, they apparently have an acute and well-developed sense of smell and hearing. The black-backed jackal is a slender creature and its sides, head and legs are a sandy tan to reddish gold in colour. Their back has a saddle from head to tip of tail that is black and white mixed hairs. Often the edges of the saddle are framed in bright rust. We next came upon a large herd (20+) of elephants making their way away from a water-hole into the bush – ranging from very large females to very small infants, then saw several ostriches, and in the very far distance, a lion. 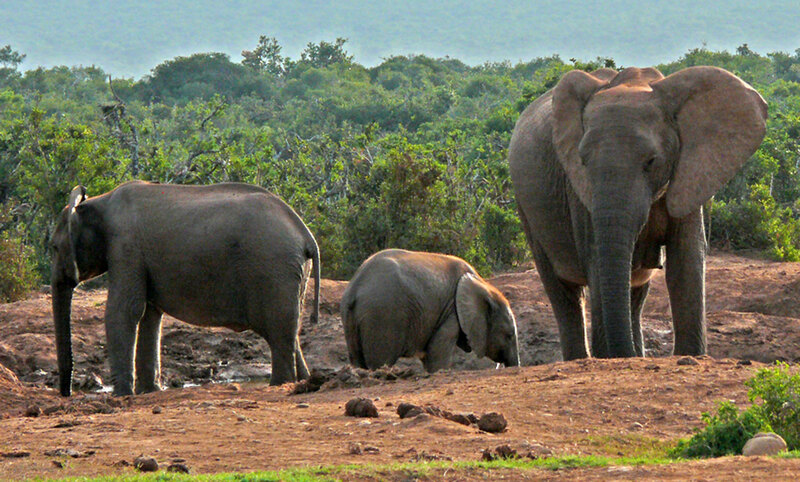 On returning to the main gate we interrupted a mother elephant with her very young calf having breakfast. The infant snuggled under its mother for a drink as Mom stripped the leaves from the top of the trees, pulling down the branches to reach the tender tips. 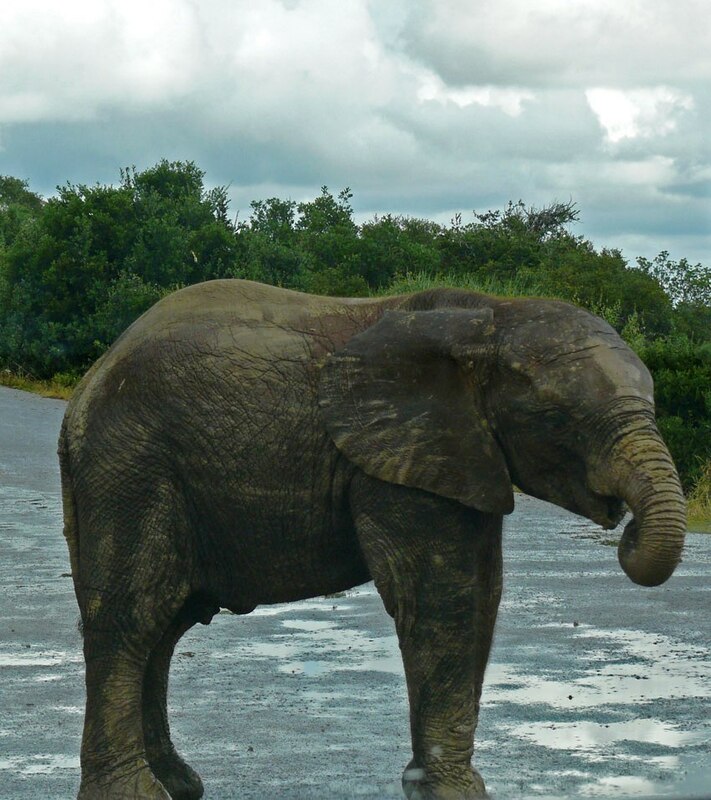 As the vehicle slowly approached them trying to persuade her to move out of the way, she suddenly became quite cross and turning from her destruction of the trees and bushes alongside the road she faced the vehicle, stood with legs splayed, shook her head and her large ears menacingly, swung her long trunk and mock charged us. It is widely known that elephant cows are very protective of their young and she was no exception. The warning was just that though, and having made us aware of her displeasure of being disturbed at breakfast, she quietly shuffled off into the bush with baby following closely behind and within seconds the pair had disappeared. 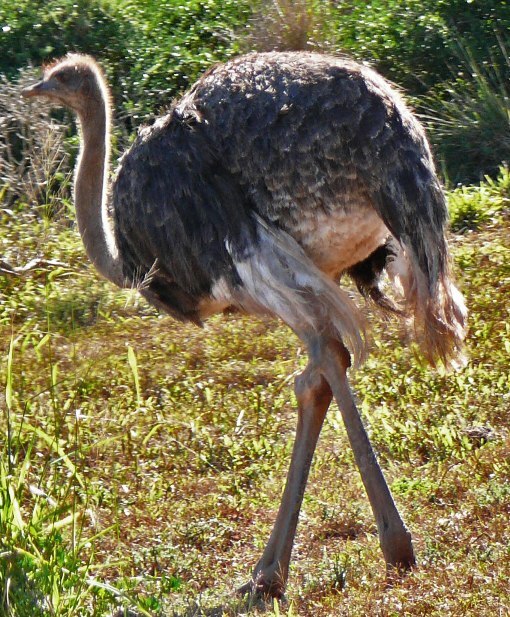 It never failed to amaze us how quickly these huge animals could vanish almost into thin air! On a later drive on our own we managed to see some of the other inhabitants of the park including Burchell’s zebra, tortoise, the interesting dung beetle, kudu, red hartebeest, warthogs, the fiscal flycatcher, the fiscal shrike, ibis, bokmakierie, greater double collared sunbird, and a bushbuck. We were amused by the sight of a campervan stuck at the side of the road because a tortoise had crawled underneath, to take advantage of the shade no doubt, whilst they had stopped to view a herd of elephants. We were uncomfortably close to a large herd of rather muddy ellies returning from Harpoor Dam and had an even closer encounter with a huge bull elephant near Janwal Pan where fortunately we had just entered the gate at the lookout point and we were slightly higher than the giant. I prayed he didn’t step on my hire car which looked very white and very vulnerable all on its own. 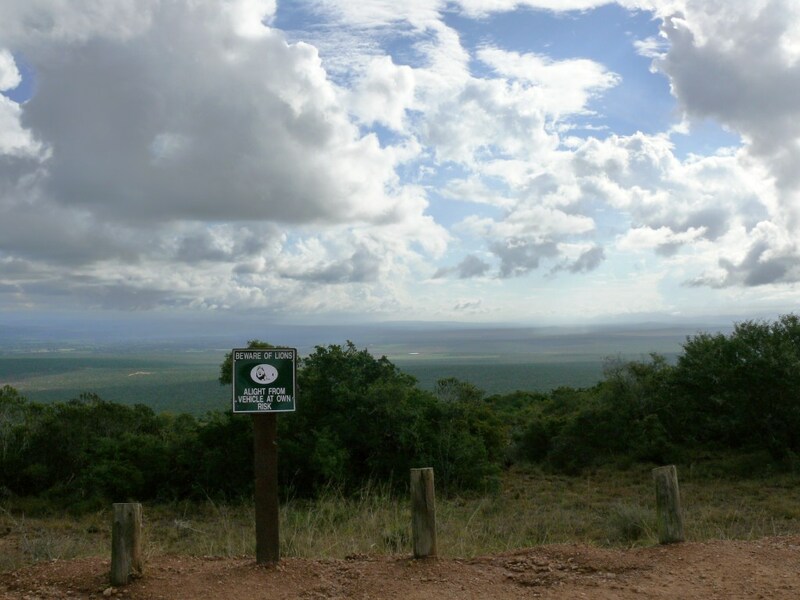 We then walked to the viewpoint overlooking the water hole which was void of any animals. Just as we were about to leave a cow arrived with three youngsters of varying sizes, right down to a tiny little thing which didn’t seem to know what to do with its trunk. 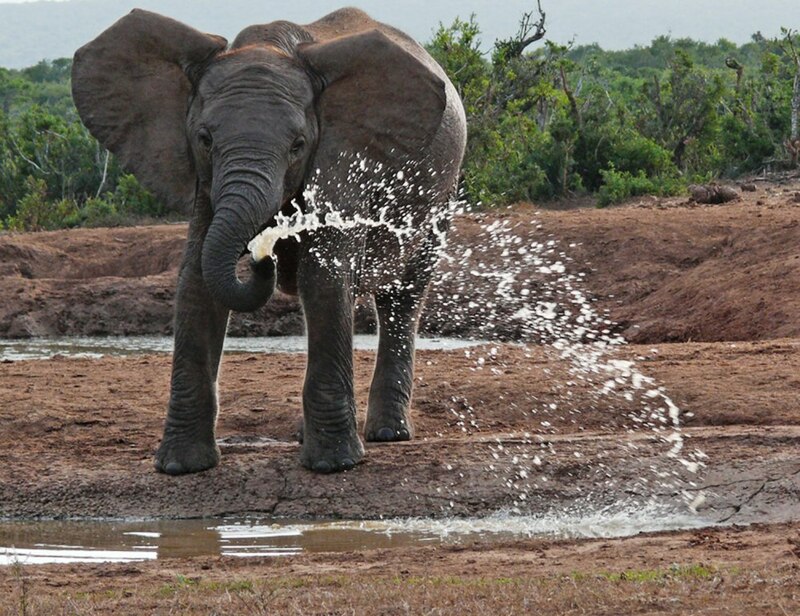 The youngsters played around in the water like young toddlers everywhere having such fun, whilst Mom drank her fill, spraying the water into her mouth providing us with the most beautiful photograph. Eventually they’d finished drinking and entertaining us and off they went again, so we returned to see if our car had survived the onslaught of the elephant walk. That evening we sat outside our rondavel with a bottle of good South African red and watched the kudu and warthogs around the Nyati Water Hole for a couple of hours before going across to the restaurant for a meal. 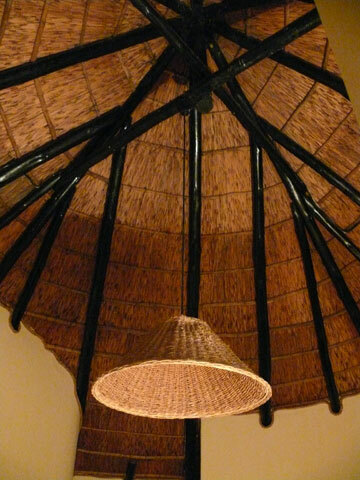 The downside of Addo is the restaurant – it is very basic and the food is poor. No gourmet dinners and not much in the way of fresh fruit or vegetables. You are much better off taking your own food and cooking it on the braai or in the communal kitchen. On day three it was time for us to leave and make our way back up the Garden Route towards Cape Town once more. We set off at 9.30 am after a rather meagre breakfast of fruit salad (mostly apple and very tart pineapple) with yoghurt and muesli, a stark contrast to the amazing breakfasts we’d been having in the B&Bs. We decided to leave the park by driving through to the southern access road and exiting at the Colchester Road gate which is on the N2 about 33 km west of Port Elizabeth. 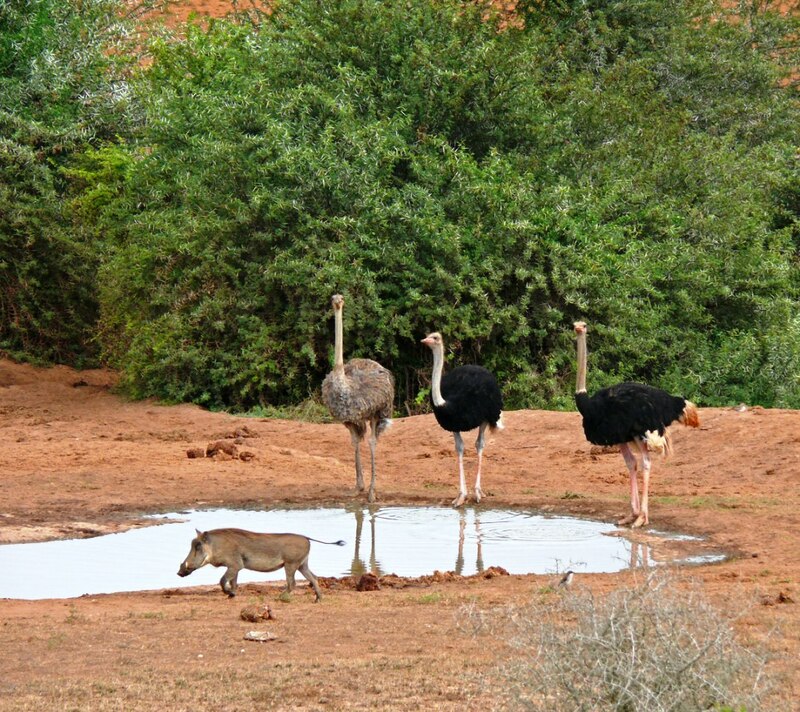 This took us along the early morning game drive route and once again we saw the kudu, ostrich and warthogs – disappointingly no cheeky meerkats on this visit. Close to where we almost literally bumped into the herd of elephants yesterday, we found another group, though this time there were other cars with us, so the elephants didn’t feel quite so threatening – this group consisted of three females and their two babies – and although we were to go along the steep hill where the lone male lion was sighted in the distance, we did not expect to see lions at this time of the day. Shortly after the spot where yesterday’s lion was seen, my husband thought he’d seen something at the side of the road ahead. We pulled up at the side of the road and I think both of us stopped breathing when a young male lion and 2 lionesses walked out of the bush onto the road in front of us. We were completely alone and they really are much larger than you think this close up. Whilst I was trying to operate the camcorder they carried on walking right up to the car and several thoughts rushed through my mind as to whether I’d heard of lions attacking a car, whether they liked or disliked the colour white (the colour of my car) and whether my collision damage waiver covered me from a dent in the roof from a large cat leaping on top, until after approximately 30 seconds I lost my nerve and throwing the camcorder to my husband, quickly put the car into reverse and retreated some metres up the road. 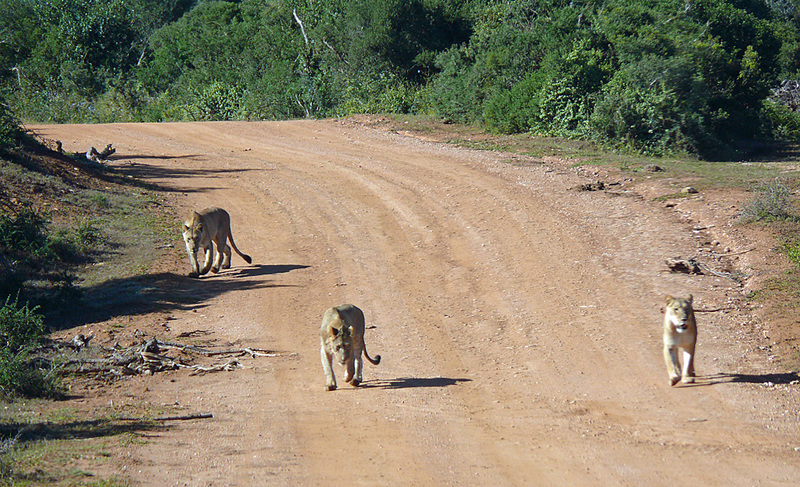 The three lions sneered at me and calmly walked back into the bush. Considering that at that time there were only nine lions in the entire park we were incredibly lucky to see three of them together. 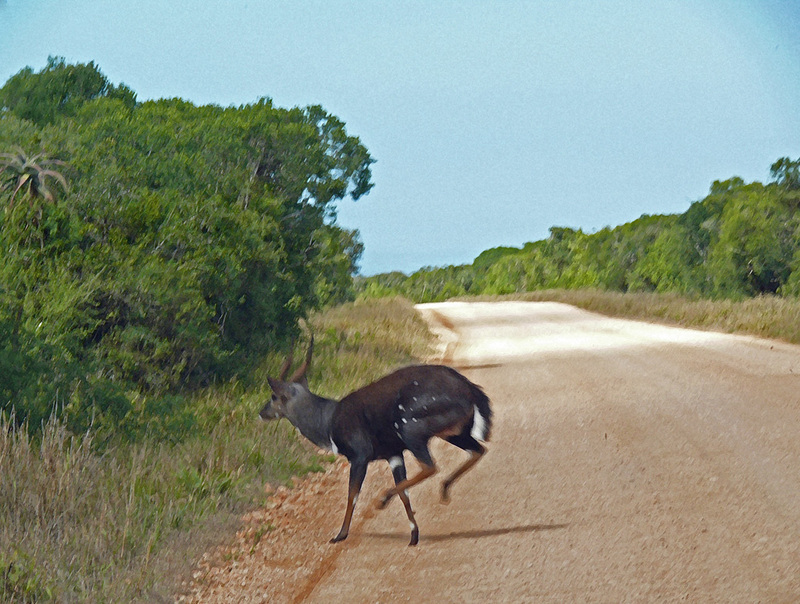 Continuing on into the Colchester section we were thinking how much nicer it was than the public road we had come in on when a kamikaze warthog leaped across the road practically in front of my wheels and a little further on a black bushbuck darted across. Fortunately neither was injured. The landscape is fantastic, sweeping hills, large termite mounds, prickly pears and in the distance the largest coastal dune field in the southern hemisphere. 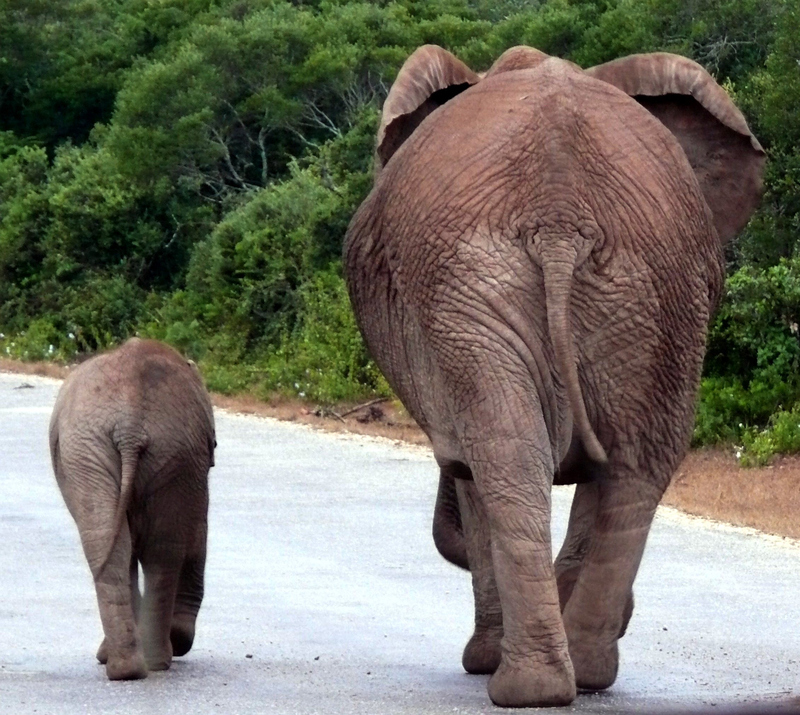 On exiting the Colchester gate I reflected on our visit to Addo – it had been enthralling, slightly scary at times and certainly worth the drive there. 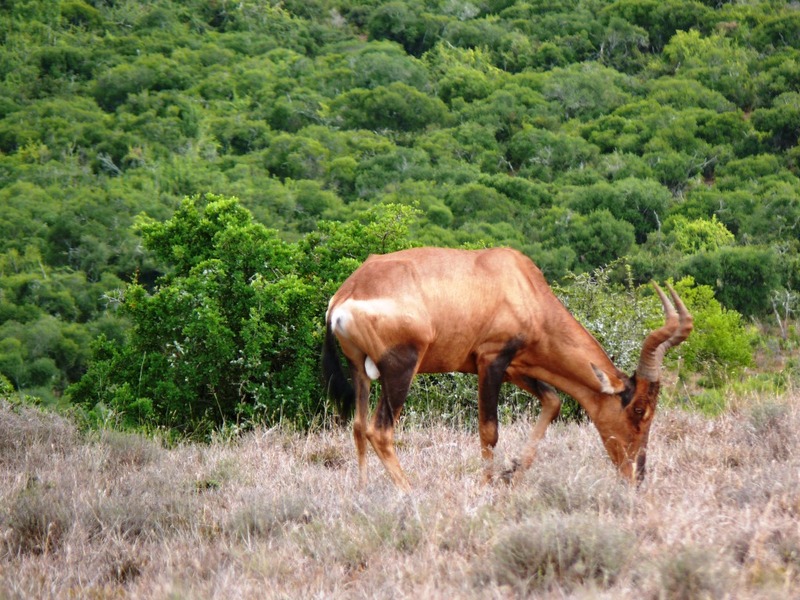 As the price for a night at a private game park is way too expensive for us we went to Addo and we don’t regret it for a moment – and should you find yourself in the Eastern Cape, South Africa – nor will you.